Your safety is our #1 priority with Wilson Luxury Limousines. 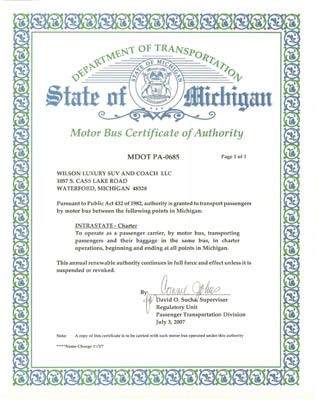 All of our vehicles are licensed by the State of Michigan and inspected by A Michigan Department of Transportation authorized mechanic. 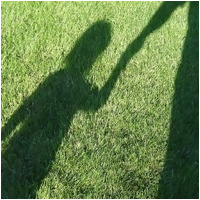 Our chauffeurs are trained, licensed and drug tested. 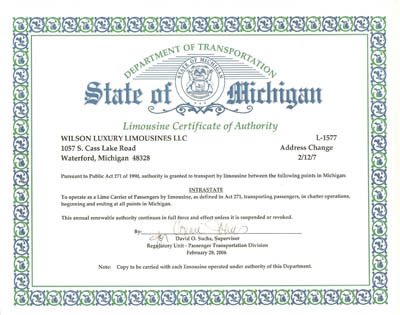 Limousine operators in Michigan are required to be licensed, carry sufficient liability insurance and have their vehicles inspected annually. Please visit the State of Michigan authorized list of carriers at www.michigan.gov/mdot. From MDOT’s home page, look under “favorite links,” then click on “Bus and Limo Info,” and select “Current List of Carriers.” If you do not see the company listed, they should not be hired. Call today and reserve with Wilson Luxury Limousines and have peace of mind knowing that you are traveling in safe hands.